Since the majority of universities now accept either ACT or SAT scores from incoming applicants, many high school students wonder which of these standardized exams they should take in order to have the best chance of acceptance into college. Since many students receive a similar score on both tests, most colleges will weigh the scores evenly. That being said, the examinations have been designed to evaluate different knowledge and skills, so there are cases in which students perform extraordinarily better on one. In order to assist in your decision of which exam is the best option for your academic abilities, the following is a guide to the key differences that separate the ACT from the SAT. In general, questions on the ACT exam tend to be more straightforward and are often much easier for students to comprehend on the first read. Instead of spending extra time understanding the question being asked on the SAT, students can utilize their test time on answering the problems more quickly. For students that have strong scientific interests, the ACT test includes a science section that the SAT lacks. Moreover, the ACT has been designed to cover more advanced concepts in math beyond basic algebra and arithmetic to allow mathematicians the chance to shine. The ACT exam also studies the whole big picture of your abilities in a single composite score, so being weak in just one content area can still lead to an impressive ACT score. While the ACT allows you to take each area of content in a large chunk of questions, the SAT is divided into ten distinctive sections with a required essay at the beginning. Students taking the SAT often report feeling energized by moving back and forth between the different subject areas, rather than completing whole chunks at one time. 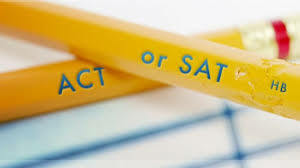 Although the ACT has an optional writing portion, the SAT has a mandatory essay that will be more beneficial for students who are looking to show off their excellent composition skills. Along the same lines, the SAT places a stronger focus on college-level vocabulary and can be best for students who have a more advanced understanding of the English language. Both the SAT and the ACT are nationally administered standardized examinations that are utilized interchangeably by colleges to evaluate applicants. Nonetheless, when you are seeking to create the best application possible, you should choose the test that will enable you to play to your academic strengths. When you choose between taking the ACT or SAT, make sure you research your top-choice college’s admissions policies on standardized exams. For those who have not narrowed the search, focus on determining which test you are more likely to excel at by evaluating your own skills. You should also take practice tests for both of these exams and look at the results once you have finished. If your scores are similar, choose the test that feels the most natural for the best match. Overall, selecting which standardized test scores to include within your college application can be one of the most essential components to the challenging admissions process. Since these examinations take on different structures and are evaluating different abilities use this guide to help discover whether the ACT or SAT test will best showcase your strengths as a student.